Oddly, sadly, NYC does not have a permanent indoor food market. Seattle has the amazing Pike’s Place Market, and we only have the Chelsea Market, which is not in the same ballpark. The New Amsterdam Public group is trying to change that. On Sunday, Dec. 16, from 11-4, there will be a one-day trail run at the old Fulton Fish Market space at the South Street Seaport. The space has been vacant for two years and it’s about time that something worthwhile goes in there….and no, Manhattan does not need another indoor shopping mall. What this non-profit group is trying to do is to create a market where local (within 500 miles is considered local) purveyors and foragers can bring their goods for sale and create a stable food community. This includes wine makers, f a butcher, cheese and fishmongers etc. 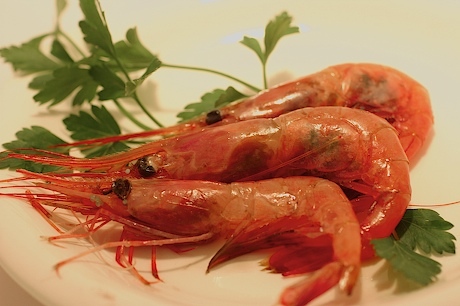 I’m hoping Wild Edibles will be bringing some of those little red Maine shrimp, they are in season right now and soooo delicious. Why bother when there are Greenmarkets scattered around the city? Because there are rules and restrictions about what sorts of foods can be sold at temporary, outdoor food stalls. Because the production and the demand for local products is greater than what the Greenmarket can provide. Because it gives the shopper a consistent source of product, and the farmer a consistent place to sell the product. And it’s a covered market, so weather isn’t becomes less of a factor. I didn’t say it was heated, so dress warmly! This should be fun: Mario Batali is scheduled to be there, handing out porchetta sandwiches. Now, this makes it an official festa, not Batali, it’s the porchetta that seals the deal. Ask any Umbrian. Location: the water side of South Street, between Peck Slip and Beekman St.